In Defense of Communism: Communist Party, Turkey (KP): Letter to the Peoples of the World - Down with Imperialism! 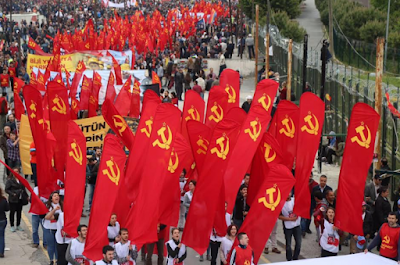 Communist Party, Turkey (KP): Letter to the Peoples of the World - Down with Imperialism! LETTER FROM TURKEY TO THE PEOPLES OF THE WORLD. "We witnessed an attempted coup in Turkey on the night of July 15. Despite its oddnesses, obscurities and uncertainties about the actors behind it, this was a genuine coup attempt. That Fethullah Gülen was behind the coup and that Fethullah Gülen has deep ties with the U.S. administration are facts. Additionally, there were more than a few traces of Pentagon and CIA behind the coup attempt. The failure of this attempted coup is to the benefit of our people. If the coup had succeeded, the working people already burdened with all the imaginable problems laid on them by the capitalist system would have had to face heavier and more destructive conditions. One needs to keep in mind that the coup plotters have a pro-NATO and Islamist orientation and they have been serving the international monopolies for decades. Another fact that one should keep in mind is that Fethullah Gülen emerged in the arena of politics within the ranks of the “Organization of the Struggle against Communism”. This organization was founded in 1960's by the CIA. What is interesting and ironic is the fact that Erdoğan, the primary target of the coup, and the coup plotters share the same ideological and political background. Islamism, anti-communism and full loyalty to the capitalist class are defining characteristics of Erdoğan as well and just like Fethullah Gülen, Erdoğan has also played significant roles in the Middle East scenarios spearheaded by the U.S. There are a few reasons behind the recent tension between U.S., E.U. countries and Erdoğan. The failure in Syria, Erdoğan's continuous triggering of tensions within Turkey, his creation of a large room for maneuver with electoral support behind him, his 'out of control' moves are some of the first reasons that come to mind. However, this tension has gradually become a factor in the contest created by the deep economic and political conflicts ongoing between U.S. and the forces under U.S. influence against the Russian Federation. As Erdoğan and his clique are in an existential struggle, facing domestic and international isolation, Putin administration, using 'carrot and stick' tactics, are advising Erdoğan to break ties with NATO or at least refrain from supporting NATO policies of Russia's encirclement. Following the coup attempt, there are many within the government circles in Turkey who are accusing U.S. and E.U. and advocating for “collaboration with Russia”. Without a doubt, this current trend is not one preferred by the bourgeoisie of Turkey but the product of the government clique looking for a safe haven and extremely scared following the coup attempt. The dissolution of Turkey's economic, political and military relations with especially Germany and U.S. can only be achieved by a socialist revolution. A change of axis within the current order will only increase the possibility of chaos, conflict, civil and international war. The developments show that tough negotiations between the current government and U.S. and EU will continue. Turkish bourgeoisie is increasingly taking more initiatives while the opposition within the system is playing the mediator role for the ongoing negotiations. On the other hand, Turkey is going through a period following the coup where all law has been suspended, all decisions and the restructuring of the state are monopolized by a small government clique. While not at a mass scale, arrests and purges that are targeting the coup plotters have now extended to progressive, revolutionary and communist sectors that have been struggling against Fethullah Gülen sect and other similar Islamist organizations. 1. You do not have to make a choice between the coup plotter Fethullah Gülen or the current government. The coup plotters executed a bloody, treacherous and insidious plan. The current government however is a relative of the coup plotters, having oppressed our peoples for years. It is the millions of workers suffering under capitalist exploitation and repression and the political representatives of those workers that you need to stand in solidarity with. 2. The debate in the international press about whether “the coup was real or not” is a trap, one that should be avoided. What needs to be discussed are the nuclear weapons in İncirlik base, NATO's covert operations, how and on whose behalf Fethullah Gülen founded this dark organization that serves the capitalist class in over hundred countries, the profits that tie Islamist Erdoğan and “secular” European leaders, the plunder of Turkey's public resources by the international monopolies and the immense exploitation all workers and toilers in Turkey are subject to. 3. While seemingly against the anti-people government of Turkey, we need to stand against all interventions of imperialist centers and attempts of a “color revolution”. There is no good and bad capitalist. The insincerity of the statements by NATO and E.U. expressing concern about the issues of freedom and democracy in Turkey is obvious. The social liberation in Turkey will be the product of only the working people in Turkey. 4. Similarly, it is incomprehensible that Putin's Russia is portrayed as the liberator. The position of the Russian Federation towards Turkey is totally pragmatic and is completely shaped by the interests of the Russian ruling class. Putin administration that extolled Erdoğan a year ago declared the same Erdoğan a war criminal following the downing of the Russian war plane and even handed the U.N. a file full of proofs. However a few weeks before the coup attempt, the love affair between Putin and Erdoğan war rekindled. We will not let the forces within the imperialist-capitalist world order be the ones determining the future of our country. 5. Moderate Islam is a concept fabricated by the U.S. Freedom of belief and worship is a fundamental right. However, religion needs to be pushed out of all fields of politics and law. There is no moderate version of it. Any person or movement in Turkey doing politics in the name of religion or with religious references is committing a crime. The current situation in Turkey is an opportunity for appreciating the importance of secularism and understanding its vital meaning for the oppressed. This opportunity can be put to good use only by linking such prior gains of humanity with the struggle against capitalism, not by clearing the field for racist and xenophobic ideologies in Europe. 6. The history of Turkey is the history of coups, political assassinations, religious fanaticism and militarism. However, this is not all Turkey is about. Throughout its history, there have also been good developments in Turkey. The Republic of Turkey was founded as a result of the struggle waged together with the young Soviet Russia against an imperialist occupation. Since 1923, struggles against war, tyranny, capitalist exploitation never ceased to exist, with mass actions of the working class. An international communist poet like Nâzım Hikmet is the product of this country. The legitimate popular movement that rose up against the government three years ago also point to the fact that there also exists a different front in Turkey that recently witnessed the fight between two Islamist cliques. We are calling on you to follow the front of the workers, to stand in solidarity with them and to make its voice heard. Against the capital, dictators, coup plotters of the monopolies, the working people, the revolutionary intellectuals and the communist militants have the tradition of internationalism. LONG LIVE THE STRUGGLE OF HUMANITY FOR EQUALITY, FREEDOM AND JUSTICE"
International Bulletin of Communist Party, Turkey No.8. 5 – Is it possible for capitalism and bourgeois politics in Turkey normalize in near future? No doubt that there is not any “normal” capitalism for the working class politics. Yet the term “normalization” refers to a more or less steady regime, which is able to manage possible crisis while the system of exploitation continues to exist. In the aftermath of the coup, such a normalization seems unlikely in Turkey. This is more related to the elusive position of the Turkish bourgeoisie along imperialist powers than to AKP’s hopes of a dictatorship. Imperialist centers, which stayed silent during the coup began unwillingly to announce their support for the “elected government” as the failure of the attempt became clear. However, media organizations dependent on such centers began to expose their real purposes. At this point, it is likely that the NATO and US will not let Erdogan in peace and unless a very particular kind of compromise is achieved, they will try to discharge him. The AKP under Erdogan rule is experiencing the fear of that. They are afraid of assassinations, a new coup, instability, and even a foreign intervention. Shortly before the coup attempt, there were claims about the lack of security for the nuclear weapons in Incirlik Base. Nowadays, pro-AKP media reflects worries about an escalation of Alevi-Sunni conflict or of the war with Kurdish separationists. On the other hand, Erdogan and his associates are also facing with the threat of an international trial for their corruption. Furthermore, there is the risk of an economic crisis. The economic instruments of imperialism, international credit institutions lowered Turkey’s grade. However, Turkey’s economy is so intertwined with imperialist system that such an intervention has limits due to the risk of triggering a larger depression. Thus we should consider that they do not control everything and a crisis with economic aspects is possible. In sum, a normalization with political “stability” seems to take some time. What they intend is to build this up on the basis of a larger consensus within bourgeois politics. Yet the position of Turkish bourgeoisie seems to keep its fragile nature with crisis potential. 6 – Is it possible for Turkey to shift towards the Russia-Iran axis? There is a tendency among Turkish bourgeoisie to develop relations with Russia and Iran based on mutual interests, and to make long-term strategic agreements. Yet, when Russian state’s class character is taken into consideration, this would not mean a shift of axis including ideological aspects, which could be possible during Soviet period. The main reason behind such a tendency is the profit maximizing impulse of Turkish monopolies. Moreover, Turkish bourgeoisie must have considered the possibility of a war between the Russian and American blocs, given the military preparations and provocations of the US, which would lead Turkey into a catastrophe as a country in the frontline. Nevertheless, it seems very unlikely for Turkey to break off with US/EU axis. European countries continue to be the largest market for Turkey. Financial system of Turkey is integrated to Western finance monopolies to a very large extent. Also, Turkish capital did quite a number of joint investments, notably in automotive sector, together with Western monopolies in Turkey. Turkish Armed Forces is dependent to NATO for almost 70 years now. So it would be a big mistake to consider the only pro-NATO elements in the TAF are Gulenists. In these circumstances, AKP and other bourgeois actors will possibly pursue conciliation, with or without Erdogan. Such conciliation would continue NATO membership and EU negotiations whereas searching for a relative autonomy in international relations. Despite all these, it seems doubtful that they will manage to find grounds for such conciliation under the escalating tension –even to armed measures- between blocs. Although Erdogan received some political and economic support from Russia in the aftermath of the coup, affording a radical shift of axis seems impossible for Turkish bourgeoisie in short or middle terms.